I’ve got mail! What should I do? Yesterday I wrote an e-mail to the manager of Best Western Hotel City in Milan about beeing treated badly by unhelpful staff. Here is the blog post. I apologize for the inconvenience and for treatmen you had from receptionist. He is new in our hotel but, of course, it is not a normal attitude to treat guests in this way. This attitude does not respect the think of our hotel. I thank you very much for your advise so we can always ameliorate our services and our quality. I want to excuse very much again and I would like to offer you a week-end for two persons, as my personal guests in our hotel or a discount of 50% on the price you paid during your staying. Waiting for your comments, will you agree our best regards. 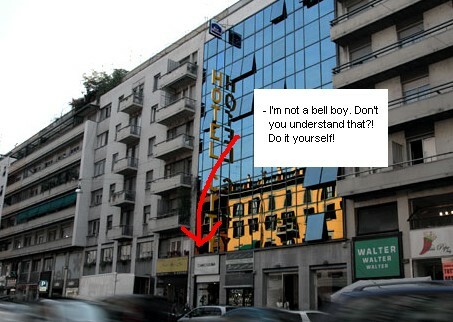 Best Western Hotel City in Milan: – I’m not a bell boy. Don’t you understand that?! Do it yourself! You should be proud of where you work and who you work for. If you love what you do, you treat your customer well. If you hate what you do, you will hate your customers – simple as that. So if you have a bad day, you should not take it out on your customers. I wonder what the owner of Best Western Hotel City in Milan thinks about this subject?! I had planned to post a nice review about Best Western Hotel City. The rooms are clean and the location is okay. But I have changed my mind after meeting mr bad-mood-guy in the reception. . He should not be facing customers but work behind closed doors where he can ruin his own day. What can you expect from hotel staff? Nothing apperently if you stay in Best Western Hotel City. As eveyone else we have to store our luggage after checking out. City hotels store room is a tiny under stairs cupboard. You can’t stand up in there, you have to crawl to get to the bags and suitcases. But don’t expect the staff to do anything. The receptionist asked me to crouch to get to our bags because he told me that he was not a bell boy. If i needed that kind of help we should stay at a five star hotel. Best Western Hotel City is a three star hotel. – Do you understand that, he asked me. I really hope they help people that are less able than me. I think the other receptionist was a bit embarrassed that this bold semi aggressive guy said those things to me because he came after me to wish me a nice trip back home. Too late. I’m not staying at this hotel again. I have written to Tripadvisor to stop or change my review! Almost one year ago Erik Qualman, the author of a fabulous book called Socialnomics, made a video clip about the Social Media Revolution. Almost 1.9 million people have watched that clip on YouTube. Now he has made a fresh updated version. He writes: ” Social Media Revolution 2 is a refresh of the original video with new and updated social media & mobile statistics that are hard to ignore” – May 2010. It’s cool – and it’s gonna be a hit – again! Her er en fersk rapport om bruk av sosiale medier i nordnorsk næringsliv! Enjoy! Fant dette i rapporten – noe å tenke på: "Googler du din egen bedrift? Vet du hva som sies om den på nettet? Eller bedre: Gjør du det enkelt for andre å snakke med og om din virksomhet? Dine kunder og konkurrenter er der allerede. Er du? ".